He, like all members of his clan, possessed dark gray eyes, black hair that hung near his cheeks to frame his face and a long ponytail in the back of his hair; later obscured by his Akatsuki cloak after joining the organization. . Iries's hair color appeared slight dull with a soft glow to it. Irie's most distinguished features are the lines that run down his face. Irie's true personality is a gentle person with an idealism that the Uchiha Clan needs to be saved and are being wronged by the Leaf. He plans to save them from the slavery that binds them to the leaf. Irie likes to keep to himself and likes taking walks and meeting new people, though now that he is considered a criminal, That is no longer the case. Since he has joined the Criminal Organization known as the "Akatsuki"; He's had to toughen his appearence and fake a personality to fit in. He joined the Akatsuki on hopes that they would help him over throw the Leaf Village and save the Uchiha from they're dreadful fate. Upon joining he found that another wrench was thrown into the gears of his plan as they only attempt to collect certain Demons so they can destroy villages, Now Irie's not only trying to save the Uchiha but also stop these People from collecting these demons. Special Characteristics: Sharingan 3 Tomoe. Description:This jutsu works in combination with the Shadow Clone Technique to create a shadow clone that will explode on command. The blast created is considerable, and could potentially kill an attacker engaged in hand-to-hand combat. Description: Irie activates this technique by simply pointing at his target. Crows flock from Irie and turn into shuriken that bombard the opponent. They then experience the sensation of their body parts turning into their closest friends. Description:The user disappears from view. Unlike the Body Flicker Technique, the user goes away slowly, as if his body is being absorbed or burned by an invisible flame. This technique is seen when Naruto first sees Sasuke in the Shippūden series, when Sasuke, Kabuto and Orochimaru flee. Description:This Genjutsu pierces the enemy's body with large illusionary black feathers, rendering them paralyzed. It's very similar to Demonic Illusion: Shackling Stakes, but it's not limited to protect the mind of the Sharingan user. Description: The genjutsu requires the use of the Sharingan. The opponent is caught in the mind world created by the user, and the victim will be tormented with the sensation of having yokes driven through their limbs, completely taking away their body's freedom. At the same time, the physical pain accompanying the illusion reveals the great use this technique has for primarily torture and such. Description:Using the Sharingan's jutsu-copying abilities, the user can turn any genjutsu back onto its original user. Description: A technique that produces a clone by projecting one's own chakra towards dozens of "crows". Because it uses crows as a medium, it requires less chakra than the normal Shadow Clone Technique, while still being able to perform techniques. The dozens of crows come together to form the body of a clone. When the chakra projected by the user is severed, the crows disperse, though the user is still able to continue to speak through it. Description:This unknown genjutsu can trap a victim in an illusion with no eye contact, similar to Ephemeral. The genjutsu traps the victim in a torrent of crows, leaving them at the user's mercy. Description:This jutsu creates a circle of crushing water spikes around the opponent. It is very difficult to evade, however it will also require a sufficient water source nearby the target, preferably right below it. Description: This jutsu envelops the surrounding area in a dense mist, reducing visibility within the affected area. The density can be controlled by the user, allowing them to create a mist so thick that even they can't see through it. Though it can't fool the Byakugan, against the Sharingan it is a most effective technique. Due to the mist being created with the user's chakra, any Sharingan-user will see the mist colored by their opponent's chakra, which will effectively hide the user from the dōjutsu. Description: The user raises his hand into the air and emit a continuous jet of water to strike the enemy and disrupt his attacks. Due to the nature of water, this technique works especially well against smoke-based attacks. Description:This jutsu allows the user to generate a spinning column of water which will take the form of a snake with a gaping maw. This snake can twist and follow her targets to literally swallow them. After it has swallowed them, it turns into a river that carries the enemy away. After activation, the user can create further snakes if needed. Description:This jutsu will gather a large amount of water to form a large spiraling stream of water. It can be guided to strike a target in a number of angles. Description:The user compresses a large amount of chakra built up inside their body and changes its shape into a dragon-shaped fireball. The user then skillfully manipulates that great fire, and attacks their opponent. Even outside of the attack range, its power and reliability are stressed. The flames have a high temperature, as they can create an updraught which in turn can give rise to thunder clouds. A master of this technique can fire off several flames in succession. Anyone caught in the technique could potentially be reduced to ashes. Description:This jutsu sends multiple balls of fire at a target. It is also possible to hide shuriken within the fireballs, creating an unexpected secondary surprise attack. For the most part, however, this jutsu is used as a distraction. Description:This jutsu allows the user to shoot multiple fire shots from their hands, which are able to cause fiery explosions on impact. The shots can also catch the opponent on fire. Description:After performing the necessary hand seals, a ninja inhales air via their mouth and, gather up chakra in their chest, then spews a large fireball from their mouth after blowing through a ring made by the thumb and index finger of the user, incinerating everything in range. Sasuke is seen doing this technique without making a ring over his mouth. The fireball may ignite externally (as evidenced by Kakashi Hatake's ability to use the jutsu without burning his mask, but may also be seen as pulling it down to blow out the fireball). Description:The user breathes fire along a cord or any other type of long object. While the technique is shown in the anime to be even larger and more devastating than Fire Release: Great Fireball Technique (and being able to melt rock), in the manga it is shown to be nothing more than a small burst of flame running along a line of wire. Description:This is a special "ninja tool summon" that allows the user to seal ninja tools like swords or kunai into, a scroll or their clothes beforehand, allowing them to be called upon when needed. The ninja tools can be summoned in an instant just by touching the sealing "marks" which can be drawn anywhere. The greatest advantage of this technique is that the time between taking out a ninja tool, taking the right stance and actually throwing it is greatly reduced. Also when a weapon such as a Fūma Shuriken is summoned, the time needed to throw it can be further shortened by having prepared the weapon in fully extended form beforehand. The ninja tools are thrown with the actual speed of a "flash of lightning," ruining the opponent's outset of the battle, and snatching away the initiative. Furthermore, because the summonable ninja tools can remain hidden until right before they are used, if this technique is mastered, there are an exceptional number of possible tactics. Description:The Shadow of the Dancing Leaf is used to position a ninja's opponent into a vulnerable aerial position. The ninja will first quickly appear below their opponent, then with a swift upper kick they will launch their target into the air. The ninja will then jump into the air to "shadow" the target with the target's back to their chest. Since this is the opponent's blind spot, it can be used as a set up to a number of jutsu. Rock Lee uses it in preparation for the Front Lotus. Sasuke, after copying it from Lee, uses it for his Lion Combo, but because he lacks Lee's training it puts some strain on his body. Description:This jutsu is a variant of Rock Lee's Front Lotus, which Sasuke develops after using his Sharingan to copy the first part of the move. 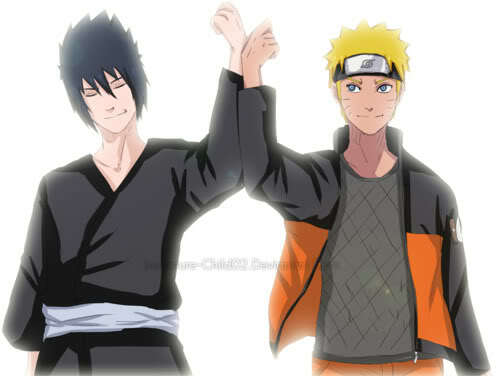 Because Lee wasn't given the chance to finish the attack, Sasuke makes his own ending to it. Like Lee, Sasuke gets to the point where he does Shadow of the Dancing Leaf to get behind an airborne opponent. He then delivers a series a of blows that differ between use. All variations end with the opponent being thrown to the ground and kicked in the chest. Description:Utilizing the abilities of the Sharingan, Irie is able to control shuriken that have wire cords attached to them (two held with the hands and one with the mouth) and manipulate their paths to tie an opponent to a nearby large object, binding them. If there is no object, the shuriken will impale the opponent. With the opponent caught, Irie can also use Fire Release: Dragon Fire Technique to burn the opponent. Description:With this technique a translucent string, both elastic and highly durable, is attached to a shuriken, making it possible to alter its path after having thrown it. An expert will have the ability to freely glide the shuriken in any direction with just a single movement of their fingertip. The first attack, challenging the enemy, is avoided and after a timelag of several seconds, it will come from behind. Depending on the performance, the possible tactics can be infinite. Description:The user of this technique throws multiple large shuriken, for instance the Fūma Shuriken, in such a way that the first shuriken hides the subsequent ones by blocking the line of sight. To the target, it appears as if only one shuriken was thrown. Origin: Bought at a black smith by his Uncle. Irie is the second child of Hyonimaru Uchiha. When Born he was exposed to the third ninja war. Growing up around bloodshed and murder made him scared of death and it made him a pacifist. Ire was also discovered to be a water and fire user just as his father before him.When he turned seven years old he joined the ninja academy and was one of the top students in each of his classes, he was naturally popular because of his looks and his soft personality. He was kind to everyone but not everyone would return those feelings one day. When he passed out of the academy and became a genin he was welcomed home warmly. When he was at the age of ten he was taken from his home by his uncle for training to become more versatile with his powers. Irie wasn't very fond of his uncle at first when he was taken from his home. Training with his uncle was very difficult as Irie was hesitant to listen to him and even trust him. Though his father seemed to trust his uncle, it made it a little easier to trust him but not much. During his training sessions he had to be in tanks of water and see how long he could stay under until it became to much to handle and see what degree of water he could stay in. His uncle seemed to know alot about his powers of water control and the sharingan. Soon he became even more powerful and his uncle even taught him some new jutsus and bought him a sword he could carry. He trained with his uncle for numerous years and soon trusted him more then anyone before. He stayed under his wing until he was 13 and was ready to take care of himself. When he returned to the Village he was the strongest in his age group now and was one of the prodigys of his generation and the #1 Rookie. His uncle signed him up for the Chuunin exam without his knowledge. When Irie reached the End of his chuunin exam the Hokage got edgy of how strong the boy had become and got suspicions that he was purposely being trained this quickly and gained power so he could be used against the Leaf in some way, The boy was far too strong to be a genin or even a chuunin at that. Sometime after the award ceremony for the Chuunin exams Irie received his title of chuunin, but when he left the ceremony he was confronted by two ANBU Black Ops. ; Operatives, they asked him a few questions about his family and just how he had gotten so strong, though they were subtle, Irie was able to pick up the meaning behind they're not so well hidden words. He clenched his fists and stared up at them and spoke that they should just spill it and tell him that they planned to kill him or something along the lines of that, he knew that the Leaf hated him, hated his kind, The Uchiha..They feared Him,His family and everything they were..The Sharingan. That's it, The sharingan was the way to take care of these to if need be. The larger ANBU grabbed Irie by his shirt and lifted him into the air roughly and stared at him through the eye slits on his mask. He told him that he was almost right, he continued that they would eventually remove this clan if he could do it. Irie furious by this statement activated his sharingan and stared into the mans eyes activated a genjutsu that would keep him occupied with a burning paper body that would keep him out of commision for a short while. The ANBU guard dropped Irie and Irie quickly dispatched of the Other ANBU guard with some complex taijutsu moves before he could make a move. Dusting off his hands he rushed towards his home from which he could see was quite bright this night, unusual. When he got closer he could see multiple ANBU Guards interrogating his Family members and other Uchiha's. ANBU were on the lookout it seemed, was it for him?.. Irie backed up a little in fear and started running, he wanted to get away from all this, the village..Anyone from the Leaf, They all hated the Uchiha and him, he no longer wanted to be with them or anywhere near them. He passed through all security checks with ease as the Guards were back at the Uchiha compound asking questions. When he got outside the village he collapsed on the ground and nearly started bawling his eyes out with tears. He stood up quickly as he got paranoid and thought he heard footsteps, though they were his imagination. He started living on the road after he got far enough, he was now a missing ninja according to the Leaf Village of utmost importance for the fact he has the Sharingan. A few years later when Irie was traveling on the road's near the Grass village he encountered two men in black clouds with red clouds that embroidered them, one of the two men were carrying what looked like a dead person. Irie attempted to hide himself from they're view not wishing to get into a fight. Thought he failed as they noticed him before he could conceal himself. The smaller one who was a swordsman dashed towards Irie screaming like a mad man. Irie activated the sharingan and ducked under his swing and used his taijutsu to knock him into the air then jumping up with him and knocked him to the ground, the man was already exhausted from the looks of it and that must of knocked the breath out of him because he looked out of it. The man stared at his partner and then towards Irea, his eyes widened slightly as he saw the boy had sharingan, he had been under strict orders to find someone with sharingan and to take him to the Base alive. The man set the corpse down and he looked like he was in top condition and he lunged forward before Irie could keep track of him and took a hit to the stomach and knocked the air out of him and he keeled over, The man grabbed Irie and threw him over his shoulder and looked down at his partner, and commented him as worthless and then crushed his throat with his foot thus killing him and took his ring. The man picked up the other corpse that he'd been carrying earlier and took them to the base. When Irie awoke he was in a dark room that was lightly lit with moonlight. He wondered what they would do with him? Did they hate the Uchiha as well? were they just like the Leaf? Or perhaps were they the leaf? he never did look at they're headbands. He sighed and stared at the wall before he heard footsteps and stared at the nearby door out of the corners of his eyes. A man that couldn't clearly be seen entered and tossed him a black cloak and said that he worked for him now and would be killed if he refused. Irie didn't respond, he began overthinking it now and wondered if he could gain some power from working with these people, he could save the Uchiha maybe with these guys. He gained the Shu ring. Zero was curious as to who the man was he saw and followed them until they walked into a tavern, this guy wasn't a resident of this village that he was sure of, his attire was different then those of this place.After trailing him successfully without being noticed he entered the bar shortly after he did and sat in an empty corner table and kept a close eye on the man, he was certainly responsible for the bloodshed he saw earlier and this could be someone very interesting to him. Soon he ordered a drink and he received it but he did not drink, he just seemed to sit there and examine the people around the bar. Not to long after ordering the drink the bartender seemed to talk to him about something and then seemed to be in fear of the man.An ANBU of the village approached the man, obviously drunk from his mannerisms and his actions. The man then laid him out over the counter and before he knew it a fight began. Afterwards a fire started, Zero stood up quickly and walked out of the bar before he was to get caught in this. If the man died in there he would not exit, if he survives he will follow him some more to find out who he is. Sure enough as Zero thought the man came crashing through the window and an explosion was heard. He smirked at how much destruction happened in a short ammount of time. The man was at the top of another building now. Zero jumped up onto another roof far enough to avoid suspicion of his trailing him. He followed him to an area where the man seemed to meditate. Zero then jumped down nearby. "That was quite a show back there" he said with slight amusement in his voice.